Decreasing sugar in our diets is more than a fad. 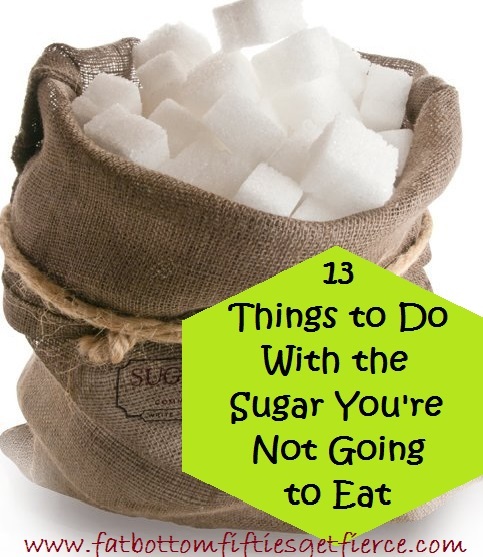 Study after study has shown negative effects from processed sugar including contributing to or exacerbating heart disease, memory problems, weight issues and affecting how we feel on a daily basis. New friend and community member, Pauline King (a/k/a The Contented Crafter), stated: “I quit sugar 18 months ago and all my ailments – and there was a long list of quite major ones – have disappeared. Weight has also disappeared – and I had a major bottom issue too – without me even trying.” Motivating stuff! So if we’re not going to eat all that sugar still perched in its tupperware containers on the shelf in our pantry, what are we going to do with it? Here’s 13 suggestions! 1. Grind it away. To oust the oil and offending odors in your coffee, spice and nut grinders, toss in a couple of tablespoons of sugar and grind for a minute or two. Toss the sugar and wipe out the grinder bowl. 2. Supplement soap. To remove dried paint, grease or grime from your hands, pour some sugar into your palm and wash with soap and water as usual. 3. Tend wounds. Studies show that a light sprinkle of sugar over a minor wound has an antibacterial effect and wards off infection. It is thought that it may even speed the healing a bit. 4. Lovelier lips. Blend a little olive oil with caster (superfine) sugar (or grind regular sugar in a food processor for a minute) to form a paste. You can add a touch of flavored extract (vanilla, peppermint, almond, etc) to jazz it up a bit. Place paste on lips, massage and blot or lick off for smoother, more kissable lips! 5. 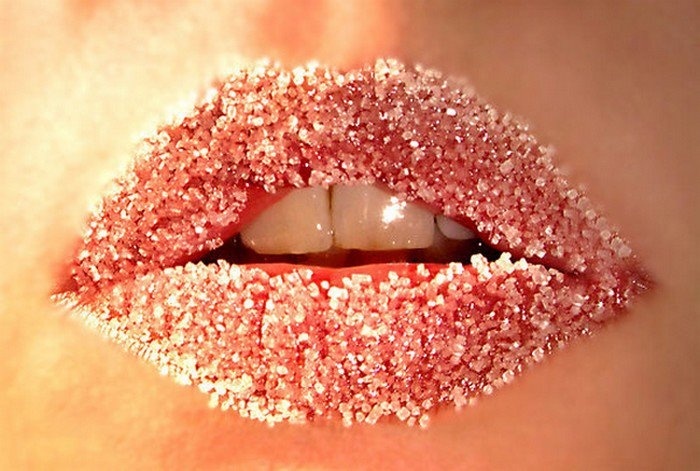 Speaking of lips: after applying lipstick sprinkle a bit of sugar on it, let it sit for a few beats, then lick or blot off. This sets the lipstick and makes it last longer! 6. Flower power. Add a tablespoon of sugar to the vase of cut flowers every time you change the water to extend their longevity. 7. Wasp away. Mix 1/2 cup of water with 2 cups of water to a boil and let cool. Pour the mixture into and empty soda bottle and leave uncovered away from guests at your outdoor gatherings. Wasps make the one-way trip in to drink the treat. Click HERE for a design that is bee safe. 8. Exfoliate. Mix a tablespoon each of olive oil and sugar. Massage onto rough spots, such as elbows and heels, and rinse off. 9. Make a body scrub. Mash an overripe banana with 3 tablespoons of sugar and 1 teaspoon of olive oil just until blended. Gently rub on youR skin then rinse off in the shower. 10. Hummingbird chow. 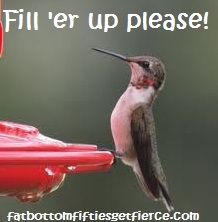 Feed the little beauties by mixing one part water to four parts sugar, boil, cool, then fill a feeder. I have skipped the boiling step and the birds didn’t seem to notice! Contrary to popular belief, it is not necessary to add food coloring. 11. Grass-B-Gone. Pretreat grass stains by applying a paste of warm water and sugar. Let sit for an hour (or longer for tougher stains) then wash as usual. 12. Keep cookies and cakes fresh. We’re assuming, of course, that these are low-sugar goodies! Simply store the baked goods in an airtight container with a few sugar cubes tossed in. 13. Get creative. Hanging out with the grandkids? Sugar cubes can be dyed, stacked and glued to create a variety of sugar cube sculptures. CHANCES ARE SUGAR IS NOW 100% JERK-FREE!